A budget renovation relies on simple solutions to transform the building into a relaxing oasis. According to OOF! Architecture, the St. Kilda–based firm that lead the project, the property's location was ideal, as it was nestled between a wetlands preserve and the nearby beach. However, the interior retained the "boxy feel" of its past incarnation as a post office. Working with a tight budget, the architects explain: "We had to think really hard about how our client could get the most bang for their buck, so we focused on what bugged them most about the house." Scroll ahead for a look at the finished project. 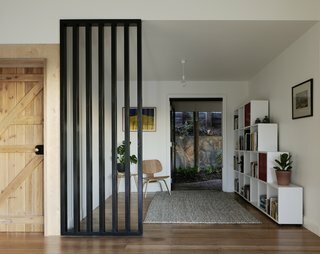 Once a buttoned-up post office, the Green Shutter House from OOF! 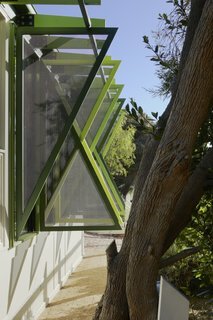 Architecture now sports custom green shutters for better outdoor connection. 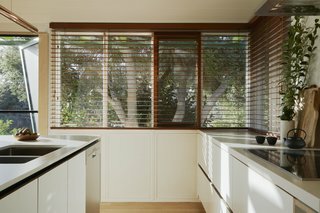 The adjustable, asymmetrical wooden shutters are extremely functional, providing privacy and shade from the hot afternoon sun, while still framing views outside. 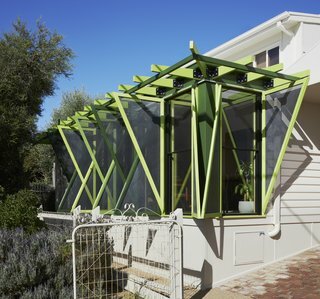 "When they're open, they also provide a sort of 'space-frame' density to the façade, like a verandah, when we had no room—or budget—to build a verandah," note the architects. "The shutters are all about being on the inside looking out—how the views are framed, how the light is filtered, how the variegated green of the shutter frames sits against the landscape of the wetlands," explain the architects. 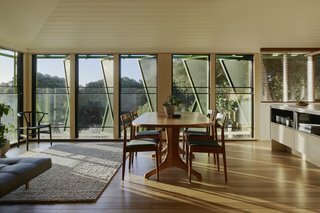 In the open living area, the angled shutters cast lovely shadows across the Tasmanian Oak flooring. 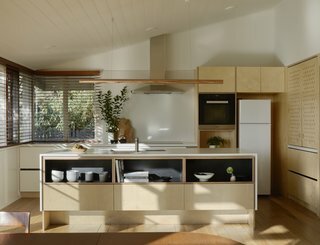 Birch plywood cabinetry outfits a streamlined kitchen space. The raw copper pendant over the island is from Giffin Design. 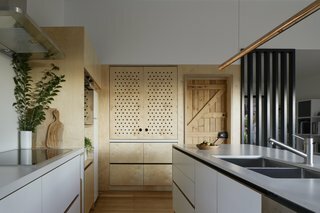 Inset perforated doors conceal a deep appliance garage and pantry to better hide cereal boxes and toaster. When opened, the doors slide back into pockets on either side of the cabinet. The house "now catches the holiday vibes and opens itself to beautiful views over serene native wetlands as you listen to the muted roar of wild surf beaches from the dune behind," add the architects. 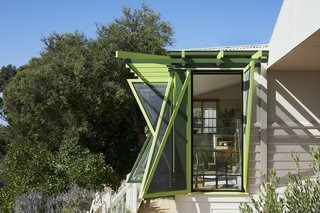 "We like to think that it's finally found it's mojo as a sunny summer beach house." A simple partial screen separates a small sitting area with a door leading outside. The custom shutters are painted KD hardwood with powder-coated perforated mesh.